The Poachers were looking to bounce back from last Saturday’s 4-1 defeat at Harborough, their first reverse of 2019. 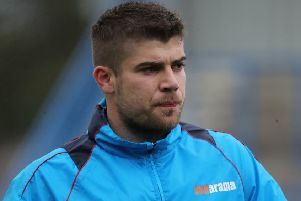 Despite a number of missing players, club captain Duran Reynolds made his long-awaited return from injury, starting on the bench and Peterborough United teenager Mikkel Fosu was handed his debut. Kyle Watkins started less than 24 hours after taking his place on the bench for parent club Lincoln City. Town took a 2-0 lead into the interval thanks to Danny Horton’s penalty and Liam Tunstall’s effort.